Had a lovely afternoon on Wednesday. Galahad, when he first caught sight of me coming through the fence, galloped over. It was clear that he was really glad I was there, and happy to come over and greet me. I squirted him with some fly spray and we chatted for a couple of minutes. Then I walked off. 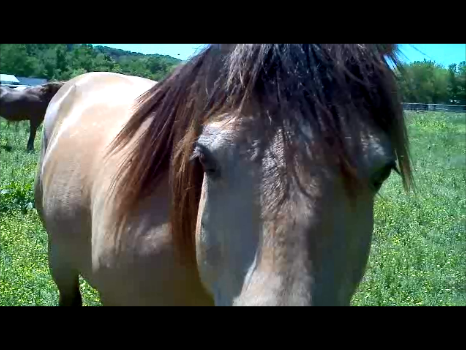 He followed me for a ways, then trotted back to the other geldings, who were standing in and around the shed. He went back to his herd the same way he had come to me—happily. It was obvious that he really liked going back to the herd. The key word is “happy.” It wasn’t that he was just going back to the herd because that’s what he was supposed to do, or that he just kind of wanted to, that he didn’t have anything better to do. He went back to the herd the same way he came over to see me—he was happy! He really liked being with his herd—he exuded happiness. Then a few minutes later, one of the horses took off at a walk toward the water tank (with a planned stop to check on me, which I discouraged with a wave of my reed). The other three followed—and again, I could feel how happy Galahad was to be in his herd, to hang out with his buddies. I begin to see what Carolyn Resnick’s method is after. There will come a point where Galahad will be happy to do whatever activity I want to do, too. With his herd, it doesn’t look like it matters to him in the least what they’re doing. Eventually that’s the kind of feeling I’m going to have with him. It’s really beautiful to watch, and I’m excited to look forward to that. It will take time, but however long it takes, it will be so worth it! He and I have years. There’s no rush. This entry was posted in Uncategorized and tagged Galahad, Resnick.